I’ve been thinking about his one for a while. It started out as something to do with a recently acquired bottle of creme de violette, which in turn was the result of my endless quest for arcane booze. In many ways this cocktail is the embodiment of this quest, having not only creme de violette but also Maraschino liqueur. 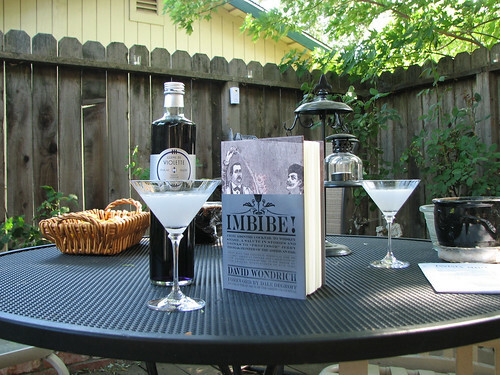 The recipe I used is from David Wondrich’s Imbibe, his take on Jerry Thomas’s original Bartender’s Guide. Even though the cocktail gained prominence with Harry Cradocks Savoy Cocktail Book from 1930, the cocktail predates prohibition-the earliest mention Wondrich finds was a passing mention in the New York Times in 1911. The first recipe (and the one Wondrich presents) was in a 1916 volume called Recipes for Mixed drink by the head bartender, Hugo Ensslin, at the Wallick House Hotel in Times Square. The Creme de Violette I found was Rothman & Winter. I doubled Wondrich’s recipe, which would have called for 2 tsp, but I like the extra teaspoon’s worth. Apparently by the time the Aviation was all the rage at Harry Craddock’s Savoy in London, the creme de violette had been omitted. Personally, while it’s certainly good both ways, I actually think that it adds more than just color. There is a really nice floral note that really adds a pleasant complexity to the drink. So, while this drink started out as a way to soak up another of my arcane liquor acquisitions, it really has grown on me. I think it’s now one of my summer favorites.